There are over 700 color combinations. These are some lanyard examples to give you an idea of what your badge holder job will look like. 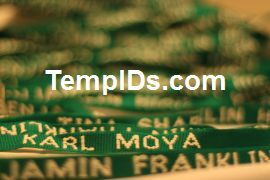 TempIDs.com is the leading source for your ID lanyard needs. 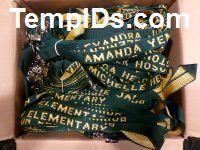 Pictured below are school lanyards for teachers with individual name along with a comprehensive slideshow that shows images of different color combinations of personalized lanyards. 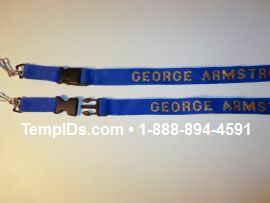 Personalizing a lanyard is to put an individual name on one side and the school or company name on the other. Standard width 3/4" Also available in 1" width. Neck straps Made in the America. Lanyards are used for holding ID badges, keys, access cards, and flash drives. School lanyards for teachers purple with athletic gold in a slideshow presentation above. If you are having problems viewing this flash file, most issues have to do with computer settings or not having the latest version of Adobe flash. 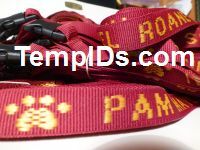 Minimum initial order is 25 personalized school lanyards. After the first order, you can reorder as few as one teacher name badge holder. Schools like that they can order as few as one personalized neck strap which is helpful for new hires. Reorders must be the same color combination and have the same custom side imprint as the originail order with the only thing that is different is the individual name on the school lanyard. Reorders have a slightly higher piece price than the initial minimum order. Most orders are for 50 pieces at $5.86 each. Free Set Up. Next price break is 100. 25-49 pieces is a higher price. Call for details.